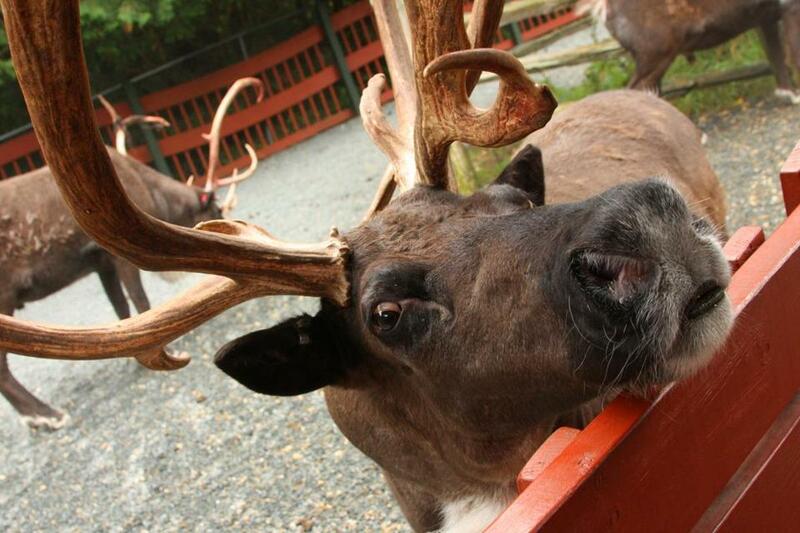 Visitors can get up close and personal with Santa’s reindeer at Santa’s Village. My 4-year-old daughter was hesitant to board the log flume at Santa’s Village, even though I assured her it was just like the panda-themed ride she enjoyed two days before at Story Land. She remained skeptical before finally climbing into the log. Afterwards, she told me I was wrong, they were not the same ride — the panda bear was faster. Generations of New England families have made Story Land in Glen, N.H., and Santa’s Village in Jefferson, N.H., into regional vacation mainstays. Odds are, if you grew up around here you have photos somewhere of your younger self balancing next to Humpty Dumpty or perched on the mitten of a giant Frosty the Snowman statue. I have both and now, after back-to-back visits, my daughter does, too. “Generation after generation visit the park to relive their childhood and share wonderful memories with their children and grandchildren,” said Lauren Hawkins, director of marketing for Story Land. Both parks are rooted in nostalgia. Look no further than the decades-old park maps decorating the queue at Story Land’s antique car ride. But each also evolved, continually adding new rides and updated services, embracing an active and responsive social media presence and easy-to-use websites. Santa’s Village even has an app. The efforts haven’t gone unnoticed. Story Land notched a 2016 Certificate of Excellence from TripAdvisor while Santa’s Village was ranked No. 20 on TripAdvisor’s 2017 Traveler’s Choice list of top amusement parks. While it may not feel like amusement park weather right now, there are reasons to keep an eye on these White Mountain destinations. Story Land is closed for the season and will reopen in late May. There’s an online sale going on now with big discounts on tickets for next year. And starting around Halloween, continuing on most weekends for the remainder of the year, Santa’s Village is open for winter operating hours and holiday events, allowing for the rare possibility of riding a reindeer roller coaster in the snow. With wistful whimsy and quirky charm, Story Land and Santa’s Village offer welcome diversions from everyday life at less cost and commitment than a trip to Orlando. Each will dredge your memory banks of family vacations past while simultaneously filling those coffers anew. Located on opposite sides of the White Mountain National Forest, Story Land and Santa’s Village are separated by about an hour drive on some of New England’s most scenic roads. Story Land benefits from being closer to the hamlet of North Conway. It is home to the best general store around (Zeb’s), an old-time railroad station, plentiful lodging, and some sneaky good food options like local brewpub Moat Mountain (get the pulled pork sandwich served on cinnamon raisin toast); or May Kelly’s Cottage, a cozy yellow house where Irish fare doesn’t get more authentic or delicious. Both parks have enough diversity in rides to entertain children across age groups, with roller coasters peppered among tamer attractions. At Santa’s Village, my daughter just hit the height requirement for Rudolph’s Rapid Transit Coaster, an exhilarating flight through quick drops and ground-hugging curves. For an unmatched and slightly unnerving panoramic view, ride the towering Christmas Ferris Wheel. At its peak, Mount Washington and the Presidential Range emerge in a striking alpine skyline. Story Land introduced a speedy dinosaur-themed wooden roller coaster in 2014, the Roar-O-Saurus. But its Polar Coaster, a dipping and diving classic clacking coaster, and the decorative frozen ice pole at the ride’s entrance, remain endearing park icons. At Story Land, shows feature talented young actors singing and dancing to classic fairy tales. Other well-known children’s tales are brought to life at the Storybook Animals section, where live animals roam around pens decorated like the corresponding story, such as the Three Little Pigs or Three Billy Goats Gruff. Many guests look to Cinderella’s castle atop the park for the preeminent character meet and greet. But just as memorable is the colossal yellow boot near the park entrance, where kids are gifted stickers from the Old Woman Who Lives in the Shoe. Our daughter danced along to Santa’s Village’s musical Christmas light show. But the highlight here is the big man himself. Santa’s house is festive and warm, perfect for a meeting with the jolly old elf. And be sure to visit Santa’s reindeer housed in a beautifully constructed wooden barn. Scattered around the park are 26 distinctive elf statues, part of the “Elfabet” scavenger hunt. My daughter screeched joyfully whenever she spotted one, rushing ahead to check another off her list. The certificate she received upon completion is proudly displayed in her room. The ability to bring in your own food is a welcome time and money saver at both parks. But expect a little indulgence, especially at Santa’s Village, which smells of cinnamon immediately upon entrance. We followed our noses to a hut behind the reindeer carousel, where they sell fresh mini doughnuts and hot cocoa. At a bakery nearby, kids decorated their own gingerbread men and women. The gingerbread was a moist, tasty spiced pastry, anything but your typical cardboard cookie. Story Land’s shaved ice hut was a must, as was the make-your-own sundae at the Dutch Village Ice Cream Shop. But a much-needed treat came in the form of another classic New England staple: the Dunkin Donuts hut right inside the Story Land turnstiles. A cup of coffee helps when debating log flume speeds with your 4-year-old. Michael Hartigan can be reached at mhartigan04@gmail.com.